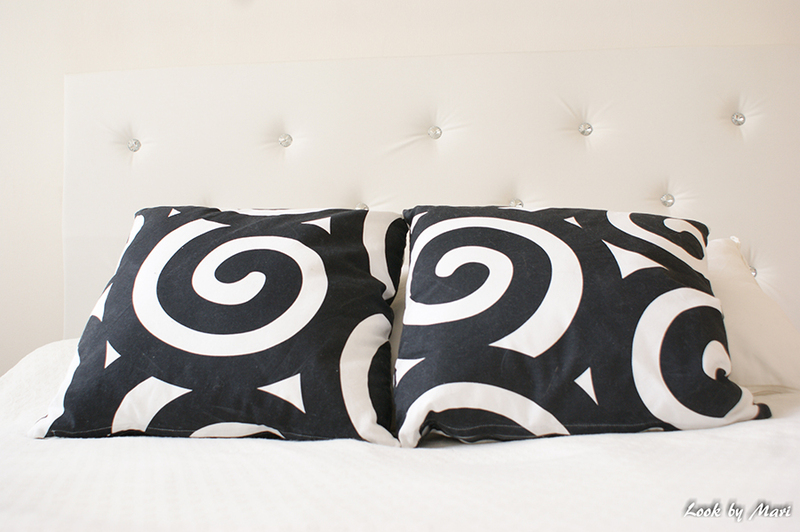 Always when someone who haven’t visit our apartment’s bedroom goes to look our bedroom, the first question is usually ”where did you bought that headboard?”. And the answer is we made it. 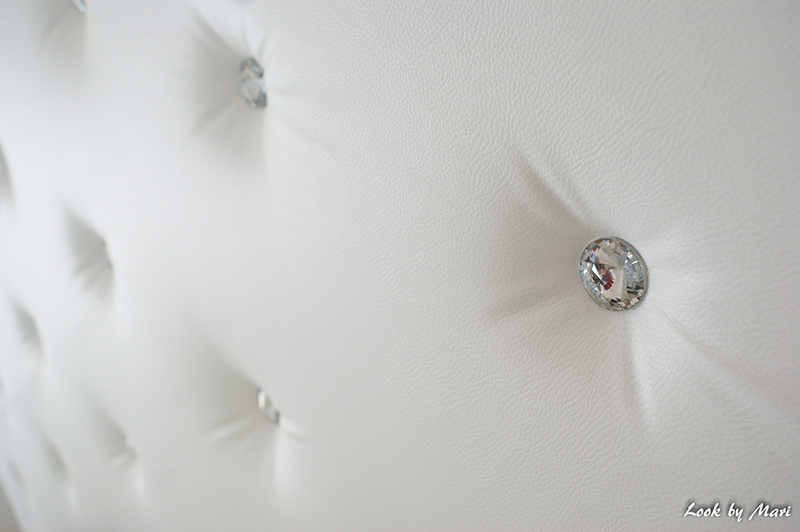 The story begins when I was little and always wanted a big headboard with diamonds. It wasn’t possible till I got a 160cm wide bed and moved together with my boyfriend. 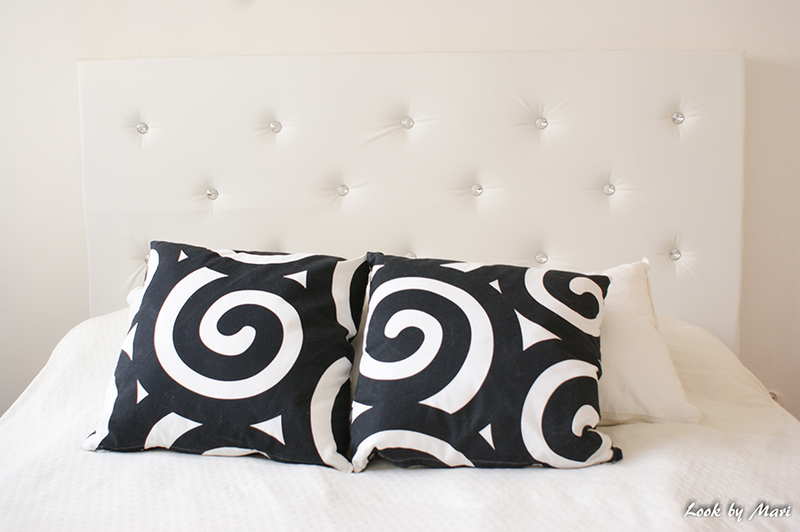 When I saw our big bed against an empty white wall I knew that I have to have that white headboard with diamonds. I started to look for it, but only I could find cost 2000-3500 euros. 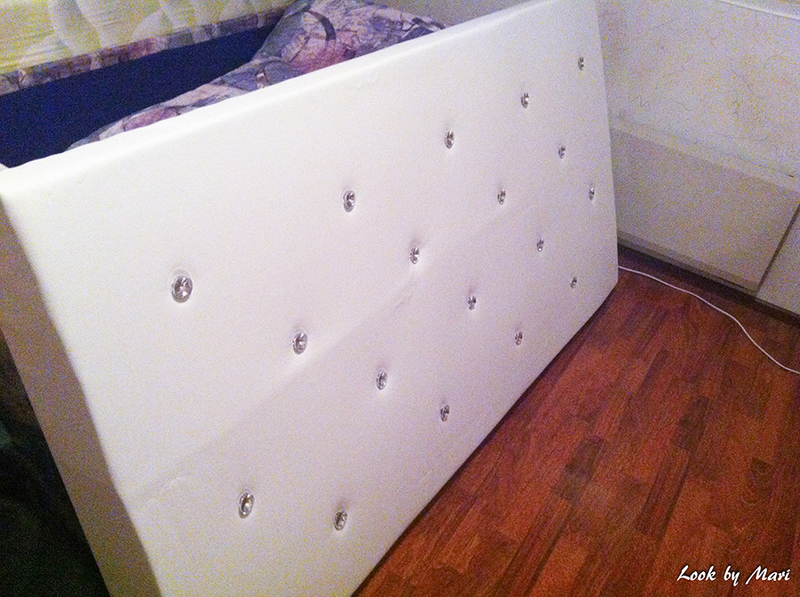 I also found blogs post where people have done headboards them selves. I knew that my talent is not building furnitures so I give up the hope. Until I talked with my boyfriend’s little brother who said ”why don’t you do it your self?” Then it klicked! Would you help us make it? And that’s how our headboard’s building started. I founded building instruction from internet and started to buy things for it. Shopping list was like this: 180 x 90cm foam rubber mattress, big diamonds with button mooring, 180 x 90cm plywood (12mm), white leatherette fabric and supporting fabric under the buttons. 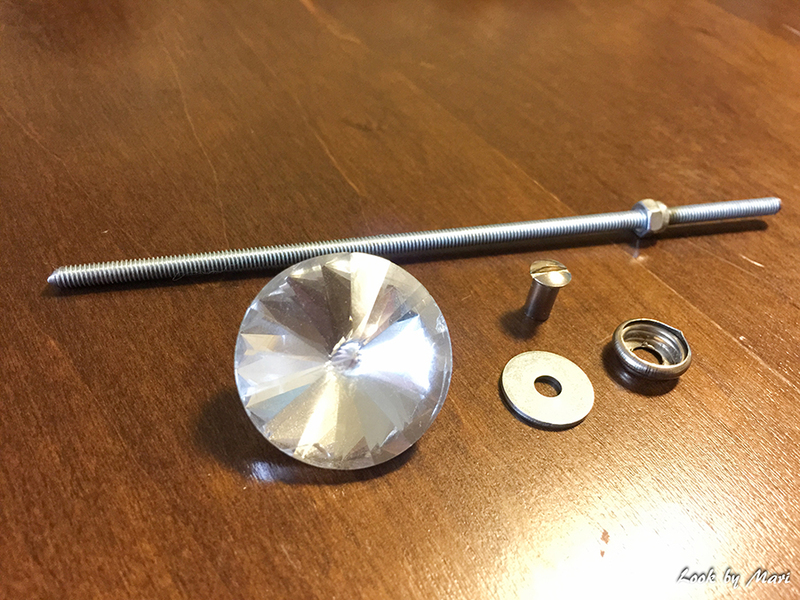 When I bought the diamonds on Ebay, they came with screws, but they were too small so we had to bought new ones. 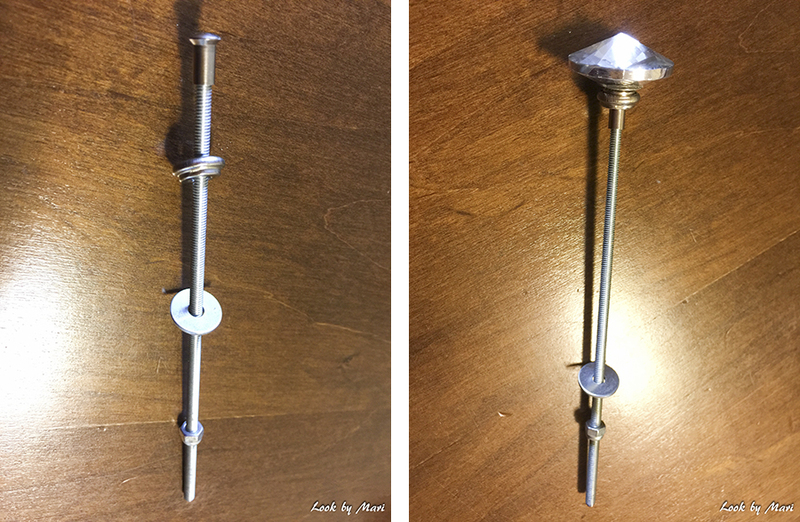 Photos about those below, but the parts are called threaded rod, socket nut, washer, locknut and they all are 4 mm (sorry if the translations are wrong, I had to use translator :D please comment if you know the right names). 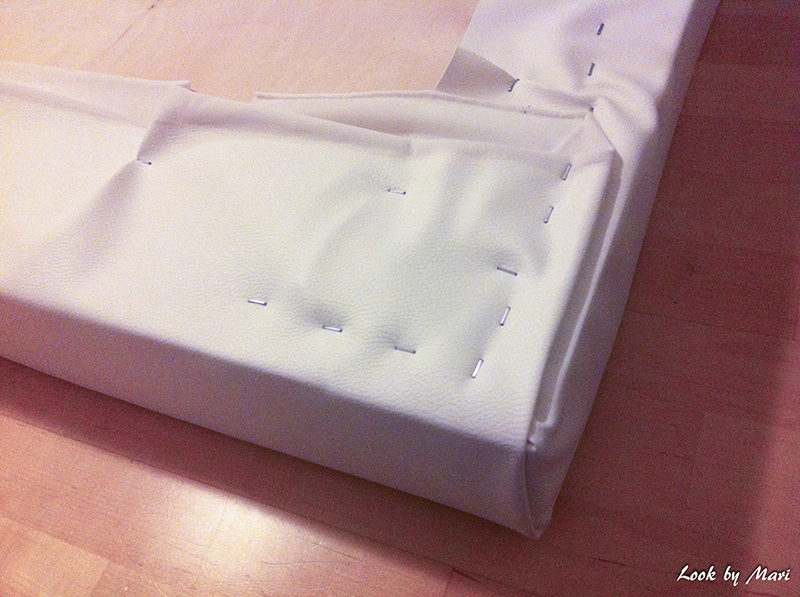 Then you also need stapler, glue and a sharp stick to make holes to leatherette fabric. 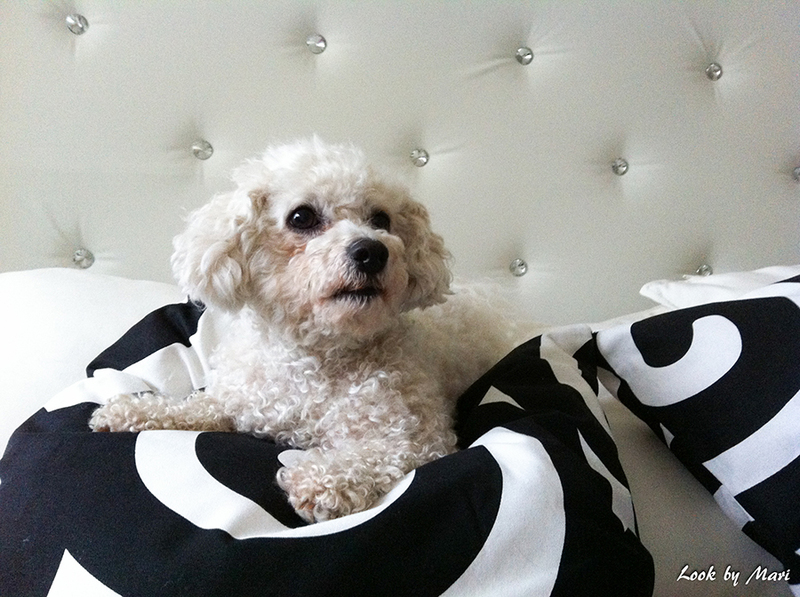 I bought the fabrics from Eurokangas and mattress from Jysk. The headboard was made on a help with my boyfriend’s little brother and dad. So how we did it? Our building instruction for a leather headboard. Cut the mattress and plywood to right size (180cm x 90cm or something else). Then measure the right places for the diamonds into the plywood and be careful. You want them to go into right places straight line and not too high. After that we drilled holes into the plywood on the places where the diamond should be. 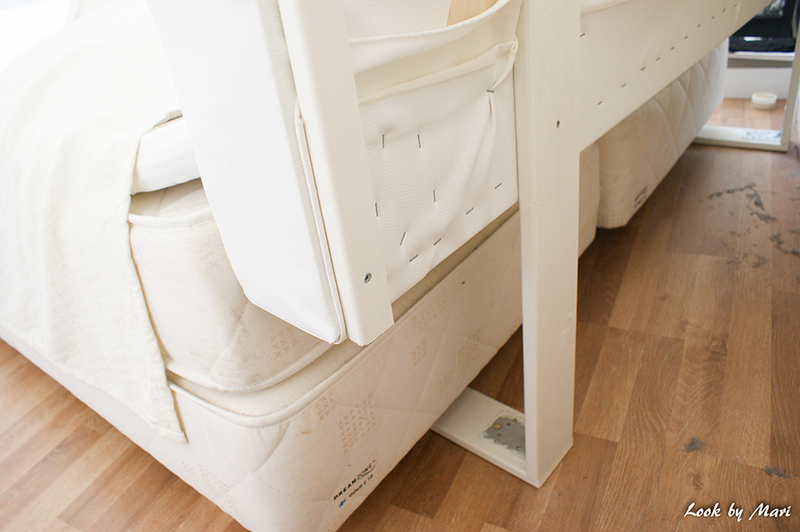 Then glued mattress into the plywood. Let it dry. Then put the leather on the floor, mattress and plywood on top of it. 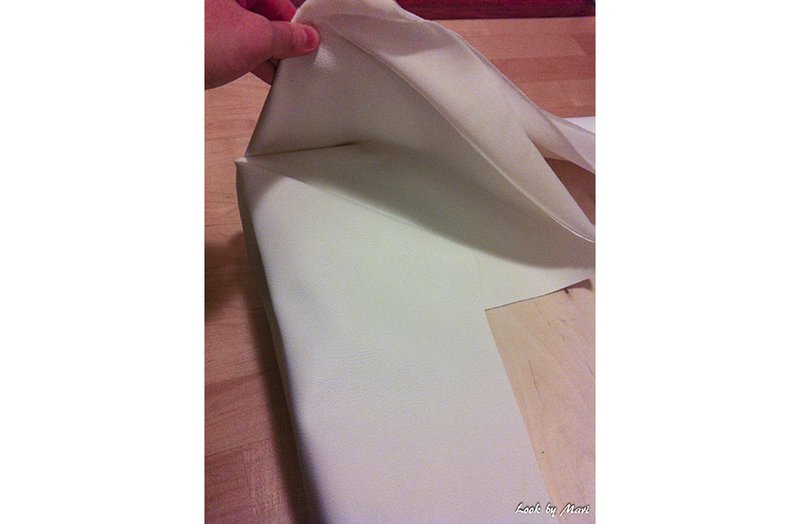 Then staple the leather into the plywood and fold the corners carefully. 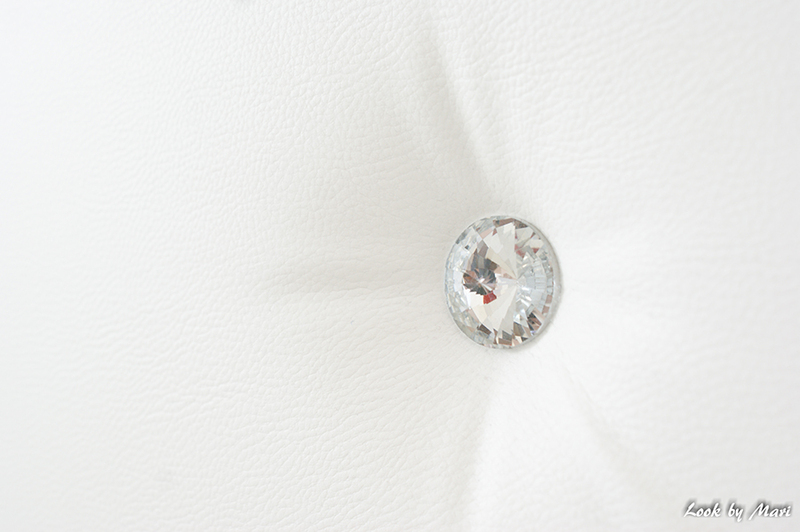 Then cut the supporting fabric on the size of the diamonds and on the center cut a hole to 4mm threaded rod. Then gather up the screws and take the sharp stick. 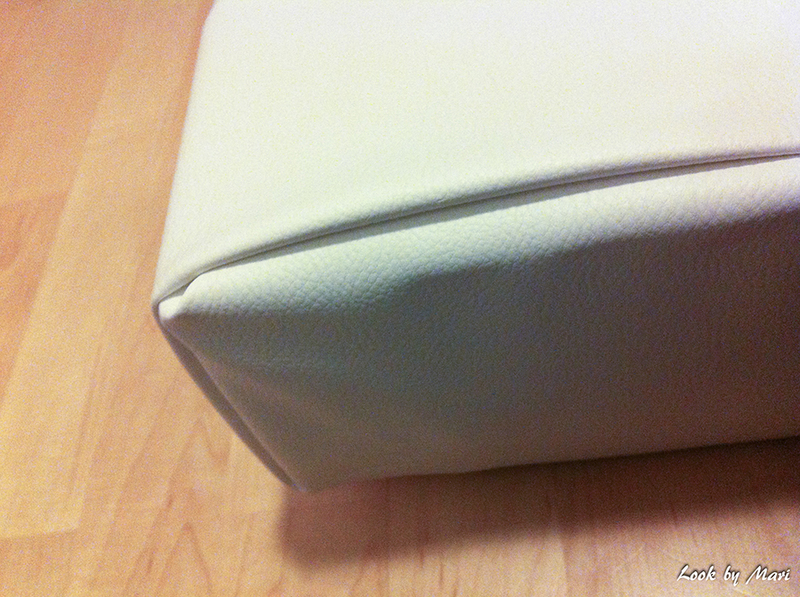 Push the sharp stick throw the hole in plywood into the leather fabric and make a hole in it carefully. Try to push it as straight as you can and carefully! 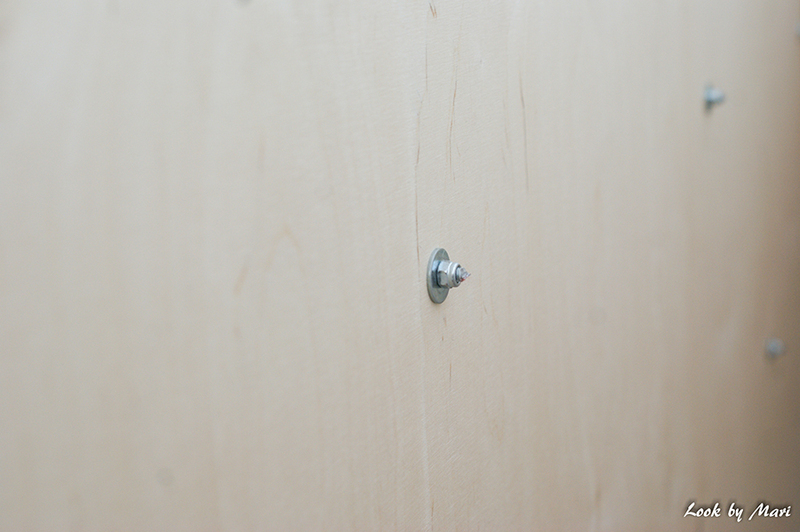 Then push the threaded rod (with the other screws) throw the leather into the hole in plywood. Put the washer and locknut into their place. 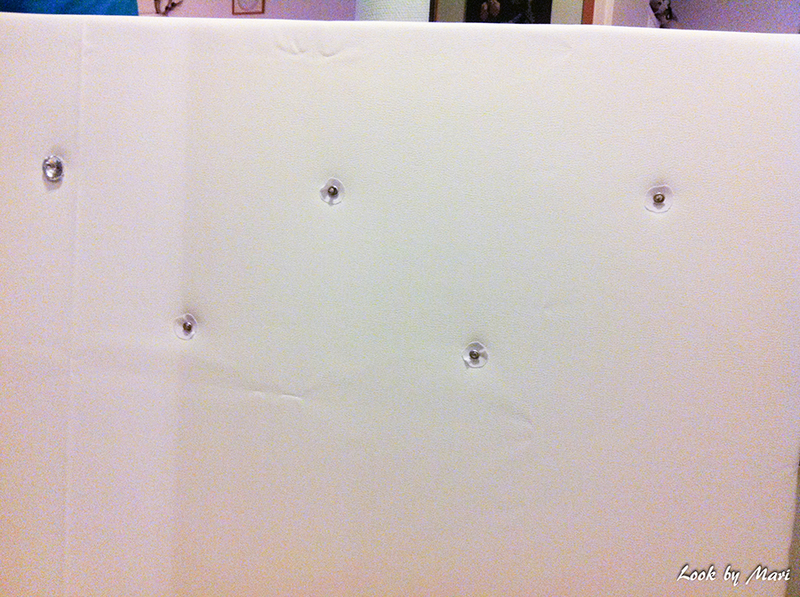 In this state the headboard looked funny, because the buttons where on the top of the leather. Tämän jälkeen leikkasin tukikankaasta timanttien alle pyöreät kankaan palaset, jonka keskelle tehtiin kierretangon paksuiset (4mm) reiät. Tämän jälkeen miehet kokosivat ruuvit eli kierretangon päähän hylsymutteri ja timantin nappikiinnitys (ei timanttia) sekä tukikangas näiden alle. Sitten hankalimpaan osioon, johon tarvitset pitkän puikon, jossa on terävä kärki. Puikko työnnettiin vanerin reiästä läpi patjan ja nahan, mahdollisimman suoraan. Asia piti kuitenkin tehdä todella varovasti, jottei nahka repeisi tai kärsisi. Tämä tehtiin kaikista 18 reiästä ja painottaen, mahdollisimman suoraan. Tämän jälkeen kierretanko viritys työnnettiin nahan reiästä sisään ja yritettiin löytää sille pari vanerin reiästä. Tämän jälkeen laitettiin prikka ja lukkomutteri taakse kierretankoon. Tässä vaiheessa sängynpääty näytti aika hauskalta, koska napit olivat samalla tasolla nahan kanssa. 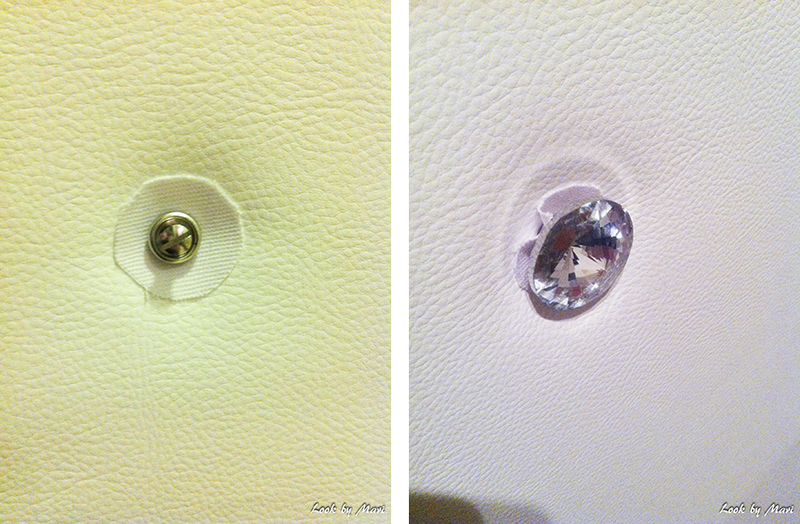 After that we tighten up the screws on the back and that maked ”the button effect”. Then we put the diamonds in their places, waited for a while to see if their would stay there and then cut excessive threaded rod off. Tämän jälkeen ruuveja alettiin kiristämään ”nappi efektin” saavuttamiseksi. Nahka meni todella piukeaksi, mutta kyllä ne aika syvälle painuivatkin. Tämän jälkeen kiinnitimme timantit nappeihin ja toivoimme, etteivät ne pongahtaisi pois paikoiltaan. Kun ne sitten pysyivät paikoillaan, leikattiin ylimääräinen kierretanko takaa pois. 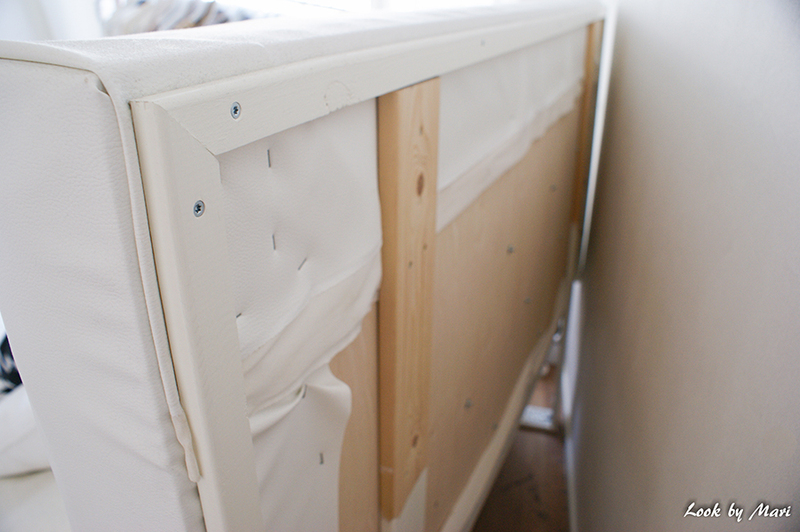 Then we made a white frame on a back of the headboard from 18mm x 70mm wood. And drilled that into the plywood. We didn’t made a bottom to the frame, because of the legs we wanted to make. L-legs was made of 18mm x 90mm wood and was attach together with a angle iron. 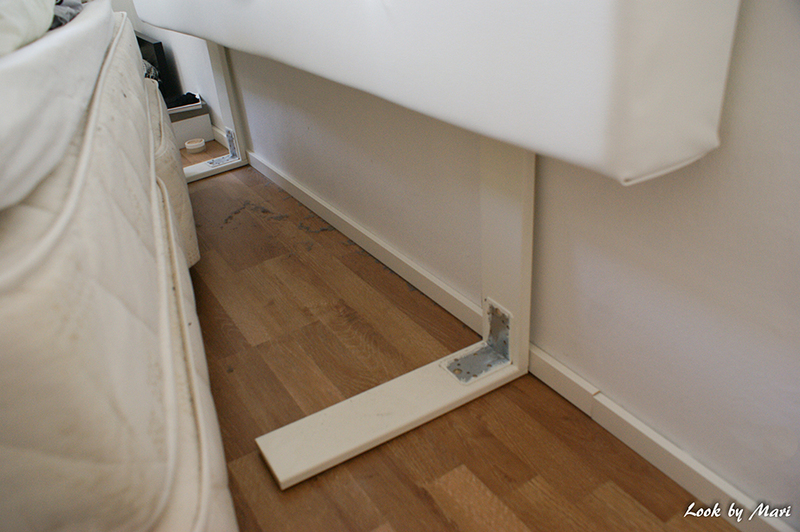 We putted the legs little pit off the sides of the headboard, so you could not see them. Then just drilled them into the plywood. Tämän jälkeen sängynpäätyyn tehtiin kehykset valkoiseksi maalatusta 18mm x 70mm rallilaudasta. Nämä vain porattiin vaneriin kiinni. Meidän sängynpäätyyn ei tullut kehystä alas jalkojen takia. L-jalat tehtiin 18mm x 90mm höylätystä laudasta ja kulmaan tuli kulmarauta. Poraamalla vaan kiinni vaneriin sen verran irti reunoista, etteivät ne näkyisi sivusta, mutta kuitenkin sen verran irti toisistaan, ettei pääty keikkuisi. I am really thankful that you shared this great article at this place. Hei, mulla olis ongelma osaatkohan auttaa? Kotonani on musta nahkainen sängynpääty ja haluaisin tuunata sen eri materiaalilla ehkä kiiltävä pintaisella kankaalla ja upottaa timantit, luuletko että onnistuis?